Product Width 44.45 cm17 8/16"
Product Depth 48.10 cm18 15/16"
Product Height 69.37 cm27 5/16"
Over 9 million refrigeration units end up in landfills every year. Additionally, improper disposal and recycling programs result in the release of harmful greenhouse gases into the environment. Danby’s initiative of creating an innovative solution to used and/or returned product, soon became a product line on it’s own. Health conscious and environmental enthusiasts. Trendy young families that values control of their food source. Consumes high amounts of fresh herbs and vegetables. Proponents of the zero-mile diet. Values energy efficiency and minimizing waste. Tries to reduce their environmental footprint. 1 in 3 households are now growing food - the highest overall participation and spending levels seen in a decade and a 17% increase in only 5 years. From 2008 to 2013 the number of home gardens increased by 4 million to 37 million households. Additionally, there was a 29% increase in food gardening by people living in urban areas, up from 7 million in 2008 to 9 million in 2013. Americans spent $3.5 billion on food gardening in 2013 - up from $2.5 billion in 2008 - a 40% increase in five years. 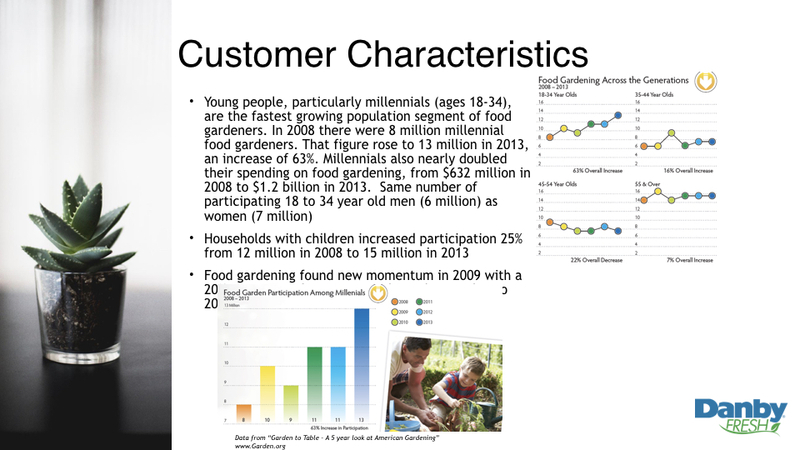 Households with incomes under $35,000 participating in food gardening grew to 11 million - up 38% from 2008. It has overtaken the non-GMO, locally sourced, organic, and natural fads. 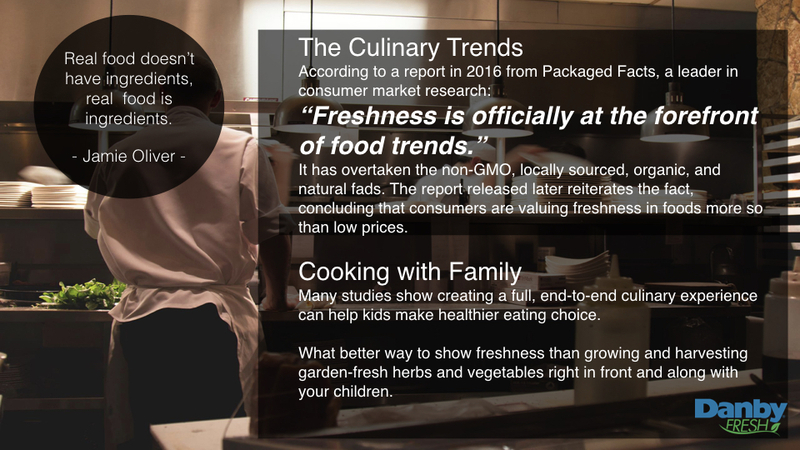 The report released later reiterates the fact, concluding that consumers are valuing freshness in foods more so than low prices. Many studies show creating a full, end-to-end culinary experience can help kids make healthier eating choice. What better way to show freshness than growing and harvesting garden-fresh herbs and vegetables right in front and along with your children. 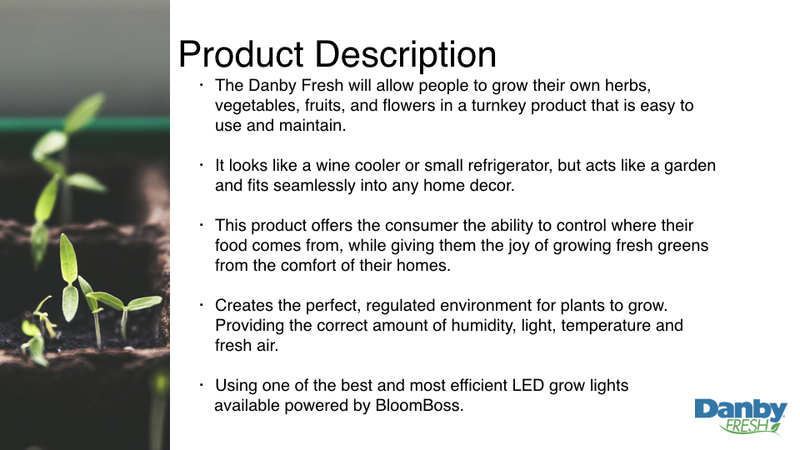 The Danby Fresh will allow people to grow their own herbs, vegetables, fruits, and flowers in a turnkey product that is easy to use and maintain. It looks like a wine cooler or small refrigerator, but acts like a garden and fits seamlessly into any home decor. This product offers the consumer the ability to control where their food comes from, while giving them the joy of growing fresh greens from the comfort of their homes. Creates the perfect, regulated environment for plants to grow. Providing the correct amount of humidity, light, temperature and fresh air. Since 2010, BloomBoss has been at the forefront of light spectrum technology. Producing smarter, higher quality, highly efficient and cooler running LED grow lights, BloomBoss has established themselves as leaders in the industry. BloomBoss’ PowerPanel LED™ Grow lights are a great alternative to traditional HID and HPS lights. The BloomBoss PowerPanel LED™ 16 Watt VEG model provides a longer lasting, more efficient and optimized full spectrum light option that is ideal for leafy greens and herbs growth, as well as the propagation of seedlings and cuttings. This is one of the reasons why we worked so closely with BloomBoss in developing the best LED grow lights possible for our Danby Fresh units. We used LEDs because we wanted to put the best technology in our Danby Fresh units to give the customer the best experience! Light is measured in wavelengths. These wavelengths corresponds to the colours we see. During the process of photosynthesis, chlorophyll absorbs the wavelengths of light to produce energy. 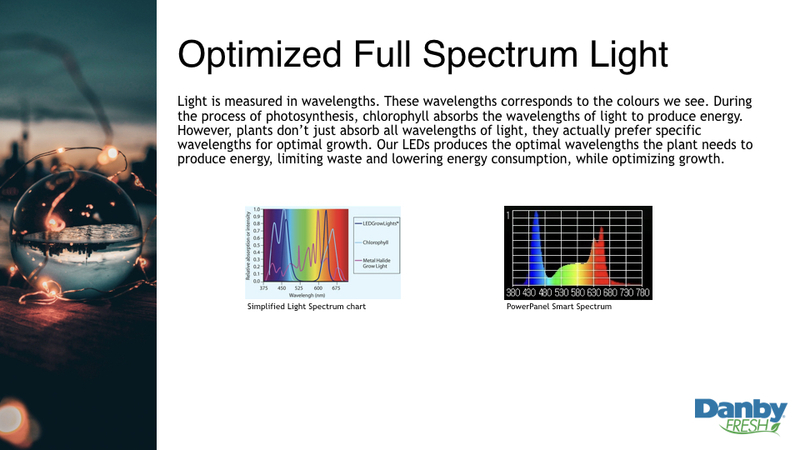 However, plants don’t just absorb all wavelengths of light, they actually prefer specific wavelengths for optimal growth. Our LEDs produces the optimal wavelengths the plant needs to produce energy, limiting waste and lowering energy consumption, while optimizing growth. The Danby Fresh countertop units are optimized to grow fresh leafy greens and microgreens. Some examples of popular microgreens can be found below. Most herbs and vegetables have a maturity date between 45-90 days. 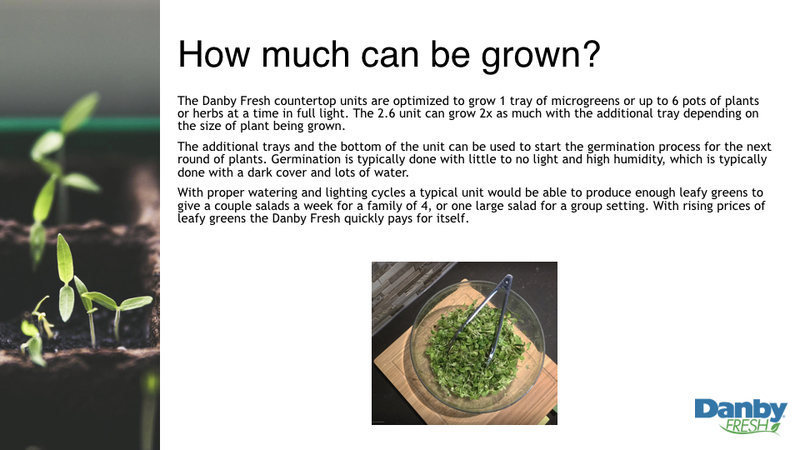 The Danby Fresh countertop units are optimized to grow 1 tray of microgreens or up to 6 pots of plants or herbs at a time in full light. The 2.6 unit can grow 2x as much with the additional tray depending on the size of plant being grown. The additional trays and the bottom of the unit can be used to start the germination process for the next round of plants. Germination is typically done with little to no light and high humidity, which is typically done with a dark cover and lots of water. With proper watering and lighting cycles a typical unit would be able to produce enough leafy greens to give a couple salads a week for a family of 4, or one large salad for a group setting. With rising prices of leafy greens the Danby Fresh quickly pays for itself.